XL Foods Inc. says it is taking full responsibility and pledged to regain the trust of consumers as a massive recall of meat intensified today. Meanwhile, Agriculture Minister Gerry Ritz repeated that the Alberta company's plant, where the E. coli contimination occured, won't reopen until he and the Canadian Food Inspection Agency are assured it is safe. The company issued a statement Thursday following further grilling of Ritz in the House of Commons by opposition MPs who accused the agriculture minister of withholding information from consumers. XL Foods said it is "working diligently with the Canadian Food Inspection Agency ... to implement changes to our food safety system to exceed existing high standards and regain the trust of Canadian consumers," and improvements will include "intensified and enhanced testing." "We will only reopen the Brooks facility when the CFIA are completely satisfied that the health of Canadians is not at risk," the release said. "We believed XL Foods was a leader in the beef processing industry with our food safety protocols, but we have now learned it was not enough. We take full responsibility for our plant operations and the food it produces [and are] doing everything we can to take the lead in an enhanced comprehensive food safety program for our plant," the release said. "XL Foods has targeted prevention, process verification and correction, response and product control as areas where food safety enhancements are required." Ritz, who earlier toured the Alberta plant, said it won't resume production until he gets written confirmation from the president of the CFIA that the plant is safe. Ritz shot down a report published earlier in the day that the plant was reopening. CFIA president George Da Pont said the plant will only resume processing once all required corrective action is taken. He also said the plant will be subjected to increased surveillance and testing. "I will not be comfortable advising the minister that that plant is safe to operate until all of those things are done," Da Pont said. On Thursday, Ritz faced more grilling from the opposition parties, including from NDP Leader Tom Mulcair, who accused the agriculture minister of withholding information from Canadians, and pressed him to resign. Liberal Leader Bob Rae noted during question period that meat from XL Foods was removed from the products exported to the U.S. in mid-September, before Canadians were alerted about the tainted beef. "Why were Americans better protected than Canadians?" Rae charged. Ritz, however, said the CFIA acted as quickly as possible on the information it had, and his office "was fully engaged ... to make sure Canadians are well-served by their food supply." CFIA officials wanted records from XL Foods on beef produced on Aug. 24 and 28. Beef processed on those days tested positive for E. coli in tests done at the U.S. border and by CFIA on Sept. 4. According to a timeline posted on CFIA's website, XL Foods turned over the information on Sept. 10 and 11. Based on those records, CFIA started investigating beef produced on Sept. 5 as well. On Sept. 12, U.S. officials found two more samples of beef that tested positive for E. coli. On Sept. 13, the CFIA banned XL Foods from shipping any more meat to the U.S. but didn't alert the Canadian public until Sept. 16. Earlier Thursday, Rae had said he wants Canada's auditor general to get involved in the expanding E. coli beef recall. Rae sent to a letter on Thursday to Michael Ferguson, asking him to "conduct a full and immediate audit of all government of Canada resources and procedures that support food safety in Canada, as well as issue recommendations for changes and improvements." Rae said questions remain about the number of food inspectors and where they work. Also on Thursday, the list of beef products from the XL plant being recalled due to possible E.coli contamination expanded again, and food inspectors said the recall could expand further. The CFIA added dozens more products to a recall that already topped 1,500 items. The recall could grow even more as inspectors trace products from the plant to secondary and tertiary distributors, manufacturers and retailers. The XL Foods was plant shut down on Sept. 27. 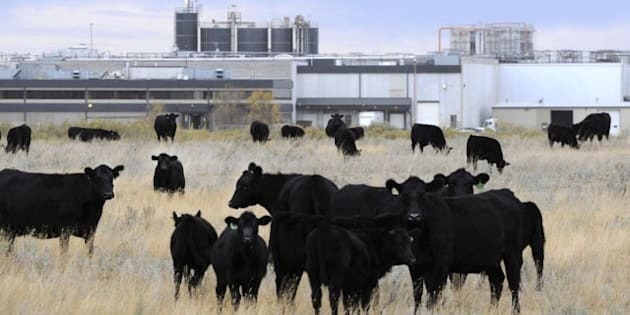 There have been five confirmed cases of E. coli illnesses in Alberta associated with the consumption of beef products from the XL Foods plant. Four other E. coli cases are being investigated. In Saskatchewan, health officials are looking into 13 cases of E. coli infection — a higher figure than normal — in September. During Wednesday night's emergency 4½-hour debate, opposition MPs claimed inspection-system cutbacks had compromised the food inspection system. The government, however, said it has hired more inspectors and that pending legislation will boost the country's food safety. "Ranchers across this country have done nothing wrong except work hard [and] try to produce the best quality beef they can, and they have been let down by a process," Ontario NDP MP Malcolm Allen said. - XL Foods didn't follow some safety procedures, agency says. Alberta Conservative MP Ted Menzies accused the opposition of trying to scare Canadians "about a food system that has some minor problems." He added: "We're looking forward to fixing those problems." Earlier Wednesday, the head of the CFIA said the plant at the centre of the biggest beef recall in Canadian history wasn't properly following some safety procedures. Meanwhile, dozens of people have joined a class-action lawsuit against XL Foods, according to a lawyer acting for a man who became sick from E. coli after eating a steak that came via the company's Brooks plant.